I love this time of year for using holiday items in new and interesting ways to make learning fun for kinders. My learning centers are the easiest way to really tap into those multiple intelligences (you remember those don’t you?) and let exploration really run wild. I know everyone has their own definition for what ‘learning centers’ are, but for me, they are something completely different than Daily 5 Stations or Math Stations. Learning Centers in my classroom are truly those ‘exploration-like centers from long ago but with some differentiated, academic-twists built in to the mix. I have 9 centers going at a time (remember 26 kiddos-I don’t want more than three at a center) and they usually get to visit them about three times a week. Centers range from the traditional kinder type activities such as housekeeping (yes I still do housekeeping but always have books, writing and math components built in), construction and art to computers, writing, word work and math. The later centers are differentiated for readiness and there are lots of choices of activities within the center. This is one activity you’ll find in my word work center this month. 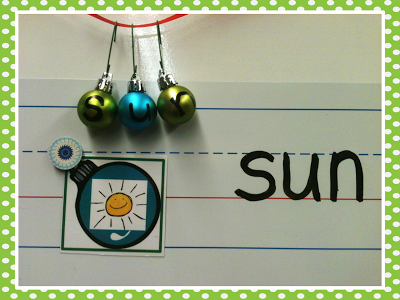 Students can pull a ornament card, string the miniature ornaments to spell the word and then write it on the dry erase board. It is differentiated because some students will only work on beginning letter sounds, while others will be working on cvcc/ccvc words. I actually have a mat and self-correcting cards for this activity and the mat works if you don’t have bulbs. Just click on the pictures to get the link. In my math center, one of the activities you’ll find those same little miniature ornaments with numbers on them. I store them in a stocking and students take turns pulling an ornament from the stocking. They compare the number with the other students and the students with the bigger (or smaller – we use a spinner to determine who) gets to keep the other students’ ornaments. The student with the most (or least) number of ornaments is the winner. I can easily differentiate this center by controlling the number range that each group of students work with depending on their readiness. And, of course, my favorite center is always the sensory or sand table. I like to find interesting things to put in it for my kinders. Last month is was corn and although I usually put different types of evergreens in it this time of year, there are a few allergies in my class so for the moment I have some shredded green and red paper in it. I’m not crazy about it so I think I’m gonna actually pull it out. 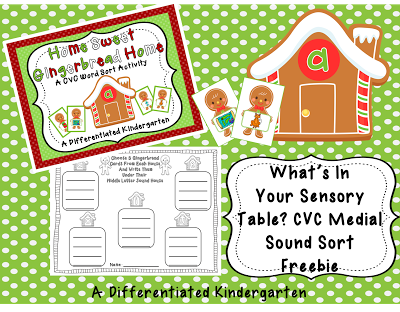 The one thing that WILL be in the sensory table no matter what else I decide to put in it is this gingerbread CVC letter sorting activity. I got these great little graphics from Lidia over at Lidia’s Doodles. 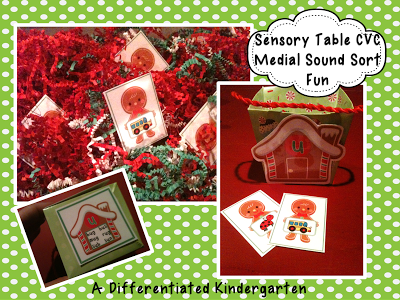 They are perfect for giving my kinders the practice they need with medial sound recognition and sorting. I made little houses with medial letters on them and attached them to a little box with a string which will hang from the side of my table. Students will take turns finding a gingerbread man and sorting them into the correct box. It’s self-correcting because the answers are on the bottom. So after they finish their recording sheet, they can check their work. Of course, you can have a copy. Just click on the picture and it will take you to the product. So I’m always curious, what’s in your sensory table this month? 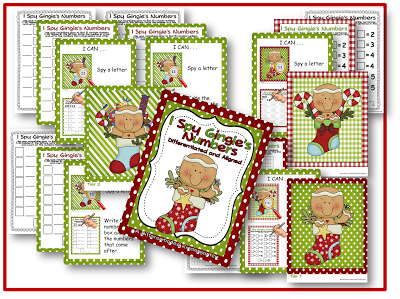 If you’re looking for more gingerbread activities, check out what I have in my TpT store by thumbing through the widget at the top right of my blog page. In case you missed it, I did add a last minute number recognition, counting on and addition gingerbread I-spy. Finally, did you guys see the new Holiday E-Book Full of Freebies!!! You have to download this. I have three freebies of my own in it. It is amazing. Make sure you take a look. It takes 2 1/2-3 weeks to get through them. I wish I could do them everyday but there just isn’t time in the schedule. Great Idea. I like your sensory table idea! Thanks for sharing! I love this idea for a sensory table, thanks for sharing!  I also just love your blog, it’s been so helpful for me as a beginning teacher to see your plans and differentiation in action. Thank you! Thanks Jessica! I hope it makes sense. Most days I feel like I’m rambling a bit. Love your blog and all that you share!! Thank you . I liked your shredded paper idea…curious why you r not liking it ? Heidi, it seemed kinda lame but the kids always love it. So I also added some jingle bells and some little holiday erasers and such to give it a little umpphhh. Oh man, I wish you worked at my school. I’d love cookies in the morning. The kids dooo love shredded paper and, fortunately, they are very good about keeping it in the table. 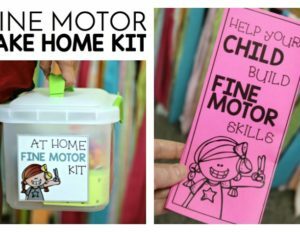 I have some other activities that I use with my sensory table if you check out my labels on the right. I struggle with finding ways to make learning developmentally appropriate and to use those MI and learning styles too. It is work don’t get me wrong. But man is it worth it in the long wrong. Please let me know if I can help ya out and let me know how it goes. I hope your kiddos love it. Do you have your ornament activity available? Lynne, I didn’t even consider putting it out but I’ll get right on it and try to have something together this week. Just bought it! Off to hunt for mini ornaments tomorrow! Thanks! Now to try and find Hanukkah and Kwanzaa stuff. Love it! Thanks so much for sharing!! Can’t wait until tomorrow! I am a second year teacher and absolutely love reading your blog! I have a big variation in my students ability and have pulled my hair out making sure each students abilities are met and challenged. Thank you for helping alleviate this stress in my life! I am a big believer in teaching to multiple intelligences and differentiating instruction where ever possible. You are an inspiration to me! Thank you for providing activities that address both of these areas. Keep up the good work! Thanks Brooke. I’m glad you can find something to use in my ramblings of teaching. Oh.my.word! I love your ideas! I am like your super stalker! I would love love to have the ornament CVC for a center. I looked at your store (which I have bought a ton from) but didn’t see it anywhere, am I missing it? I would love to print it and put it in for the kiddo’s this week! Do you just have CVC of CVCC for the higher lovies? LOVE LOVE the GingerBread Stuff!! I am also looking to get the sensory table started after the first of the year!! I gotta have a more long term goal going for the center or it will die and I will be sad! Thanks for the ideas!! Just happened upon your blog…what a great resource! Your classroom sounds awesome! Thank you so much for the great freebies! I was looking for something I printed yesterday that didn’t turn out well, and now I can’t find it! It is a snowman Dolch Word List 1 that you use a magnifying glass to read…could you please help me? I just found out your blog, and I love it immediately. The classroom looks like so attractive,which also helps me imagine a kindergarten’s classroom since most of my schools were in China. In the words of Lilly, “Wow!” A that is just about all I can say. You are amazing! Thank you for making such quality work to share. 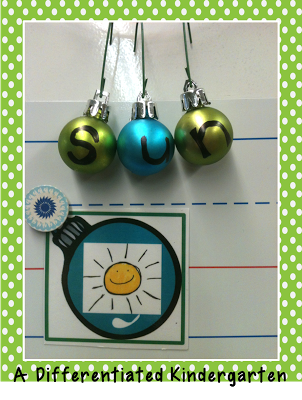 I am loving the ornament idea for my literacy center. Off to find mini ornaments for the activity! I will use it to finding letter ornaments to match a worksheet I make! Your creativity is inspiration for me!